The ASCO Bone-Modifying Agents in Multiple Myeloma GUIDELINES Pocket Guide is based on the latest guidelines of the American Society of Clinical Oncology and was developed with their collaboration. It contains graded recommendations for the use of bone-modifying agents in multiple myeloma. Founded in 1964, the American Society of Clinical Oncology is the world's leading professional organization for physicians and oncology professionals caring for people with cancer. 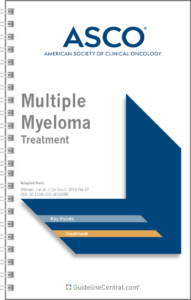 The definition of active multiple myeloma requiring therapy has been revised. HyperCalcemia, Renal dysfunction, Anemia or Bone disease (CRAB) remain indications for treatment. In the absence of these CRAB features, patients who have >60% bone marrow plasma cells, involved free light chain >100 mg/L with kappa/lambda ratio >100 fold, or more than one site of bone disease on MRI or on PET CT scanning are now recommended for treatment. Any patient who is on treatment for active multiple myeloma should receive bisphosphonate therapy. Clodronate is approved worldwide, except in the United States, for either oral or intravenous administration. However, the recent MRC IX RCT shows that intravenous zoledronic acid is superior in avoiding skeletal complications. For multiple myeloma patients who have, on plain radiograph(s) or other imaging studies (MRI or CT scan), lytic destruction of bone or compression fracture of the spine from osteopenia, intravenous pamidronate 90 mg delivered over ≥2 hours or zoledronic acid 4 mg delivered over ≥15 minutes every 3–4 weeks is recommended. Alternative treatment includes the use of denosumab, a monoclonal antibody targeting RANKL. Starting bisphosphonates in patients with solitary plasmacytoma or smoldering (asymptomatic) or indolent myeloma is NOT recommended. Intravenous pamidronate or zoledronic acid is recommended for patients with pain as a result of osteolytic disease and as an adjunctive treatment for patients receiving radiation therapy, analgesics, or surgical intervention to stabilize fractures or impending fractures. Denosumab is an additional option. The Expert Panel supports starting intravenous bisphosphonates in multiple myeloma patients with osteopenia (osteoporosis) but no radiographic evidence of lytic bone disease. Starting bisphosphonates in patients with monoclonal gammopathy of undetermined significance is NOT recommended unless osteopenia (osteoporosis) exists. As a result of increased concerns over renal adverse events, dosing guidelines for patients with pre-existing renal impairment were added to the zoledronic acid package insert. The guidelines recommend that patients with pre-existing mild-to-moderate renal impairment (estimated creatinine clearance, 30–60 mL/min) should receive a reduced dosage of zoledronic acid. No changes in infusion time or interval are required. NOT recommended for use in these patients. Recent data comparing denosumab to zoledronic acid has demonstrated fewer adverse events related to renal toxicity with denosumab, and this may be preferred in patients with compromised renal function. Pamidronate 90 mg administered over 4–6 hours is recommended for patients with extensive bone disease and existing severe renal impairment (serum creatinine level >3.0 mg/dL [265 µmol/L] or an estimated creatinine clearance <30 mL/min). Although no dosing guidelines are available for patients with pre-existing renal impairment, the Expert Panel recommends that clinicians consider reducing the initial pamidronate dose in that setting. 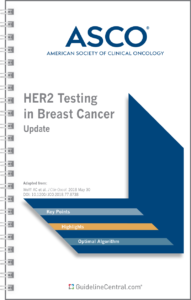 The Expert Panel suggests that bone-targeted treatment continue for a period of ≤2 years. Less frequent dosing has been evaluated and should be considered in patients with responsive or stable disease. In patients who do not have active myeloma and are on maintenance therapy, the physician may consider a 3 month interval of bisphosphonate administration. There are no data to support a more precise recommendation for duration of bisphosphonate therapy in this group of patients. For those patients in whom bisphosphonates were withdrawn after 2 years, the drug should be resumed upon relapse with new-onset skeletal-related events. Denosumab should NOT be stopped abruptly given its reversible mechanism of action. The Expert Panel recommends that serum creatinine should be monitored before each dose of pamidronate or zoledronic acid, in accordance with FDA-approved labeling. Denosumab does not require monitoring of renal function. In patients who develop renal deterioration without apparent cause during bisphosphonate therapy, zoledronic acid or pamidronate should be withheld. Bisphosphonate therapy can be resumed, at the same dosage as that before treatment interruption, when the serum creatinine returns to within 10% of the baseline level. Denosumab requires no dose modification. Serum calcium should be monitored regularly, and serum vitamin D levels should be evaluated intermittently. Hypocalcemia is an adverse effect of all bone resorptive agents and is more pronounced with denosumab. Patients should be calcium and vitamin D repleted. The Expert Panel also recommends intermittent evaluation (every 3–6 months) of all patients receiving pamidronate or zoledronic acid therapy for the presence of albuminuria on a spot urine sample. In patients experiencing unexplained albuminuria, then a 24 hour urine should be obtained to assess for >500 mg/24 hours of urinary albumin, and discontinuation of the drug is advised until the renal problems are resolved. These patients should be reassessed every 3–4 weeks (with a 24 hour urine collection for total protein and urine protein electrophoresis), and pamidronate should be reinstituted over a longer infusion time (≥4 hours) and at doses not to exceed 90 mg every 4 weeks when the renal function returns to baseline. The Expert Panel supports the use of screening urinalysis for proteinuria but underscores that a 24 hour urine collection for determination of total protein and electrophoresis is required if the test is positive. Although no similar guidelines are available for zoledronic acid, some Expert Panel members recommend that zoledronic acid be reinstituted over a longer infusion time (≥30 minutes). The use of the biochemical markers of bone metabolism to monitor bone modifying therapy use is NOT suggested for routine care. Osteonecrosis of the jaw (ONJ) is an uncommon but potentially serious complication of intravenous bisphosphonates and denosumab. The Expert Panel agrees with the recommendations described in the revised FDA label for zoledronic acid and pamidronate, Dear Doctor letters, a white paper, and various position papers or statements. All patients should receive a comprehensive dental examination and appropriate preventive dentistry before bone modifying therapy. Active oral infections should be treated, and sites at high risk for infection should be eliminated. While on therapy, patients should maintain excellent oral hygiene and avoid invasive dental procedures, if possible. Continuation of a bone-targeted agent in the setting of ONJ has to be individualized and dependent on a risk benefit ratio and severity of bone disease. * Prices Per Dose were for a single infusion or per single injection. Prices for drugs reimbursed through Medicare Part B only were identified from the 2nd Quarter 2017 Medicare Payment Allowable Part B Drugs Average Sales Price (ASP) Data (https://www.cms.gov/apps/ama/license.asp?file=/Medicare/Medicare-Fee-for-Service-Part-B-Drugs/McrPartBDrugAvgSalesPrice/Downloads/2017-April-ASP-Pricing.zip). Drug price may vary by plan and by pharmacy where a medication is filled (e.g., preferred or non-preferred pharmacies). Note: Drug prices are dynamic, and thus the prices listed in the table may not reflect current prices. • Bone modifying treatment continue for a period of ≤2 years. Less frequent dosing has been evaluated and should be considered in patients with responsive or stable disease. Continuous use is at the discretion of the treating physician and the risk of ongoing skeletal morbidity. Retreatment should be initiated at the time of disease relapse. • While on therapy, patients should maintain excellent oral hygiene and avoid invasive dental procedures.